Bethlehem is, historically, a sacred religious site. Christians know it as the birthplace of Jesus and the home of the Church of the Nativity, one of the oldest churches in the world. To Jews, it was the home of King David of Israel and the site of Rachel’s Tomb on the outskirts of town. Pilgrimages to these grounds are frequent, especially around the holidays. But there’s another, very distinct, side of Bethlehem. It’s part of the West Bank, an area that’s disputed by Israel and Palestine. In 2000, the Israeli West Bank barrier was built along the Green Line, a demarcation line established in 1949. Israelis claim they are protecting themselves from terrorism. Palestinians believe they are being segregated, even imprisoned, by the wall. It’s led to violence, including suicide bombings, in the 17 years since its creation. Unsurprisingly, aside from the truly devout, Bethlehem isn’t a major tourist destination. So why did someone recently open a boutique hotel along the barrier? One word: Banksy. The anonymous artist is famous for their street graffiti. Stenciled drawings usually appear on city walls overnight. Most feature dark humor. Many are politically motivated. They all try to engage the public. The Walled Off Hotel is no different. 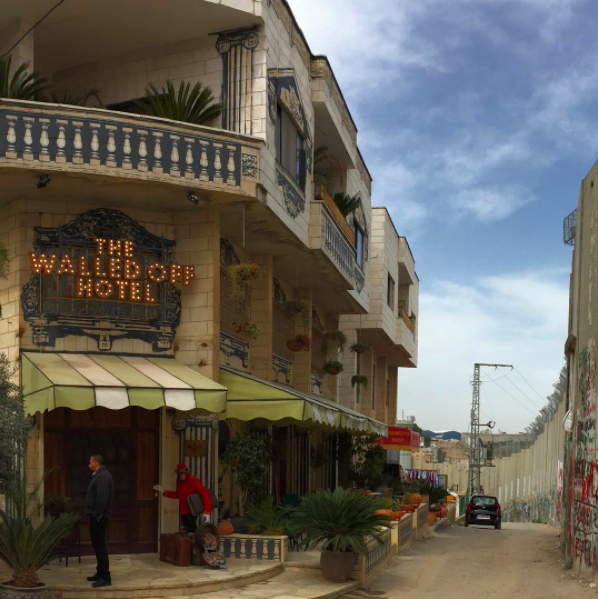 The Walled Off Hotel sounds like an art installation. 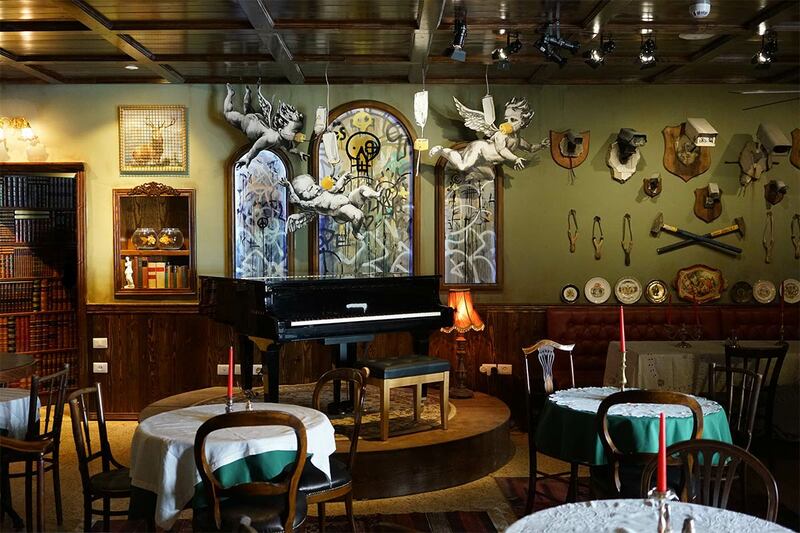 The lobby, the rooms, and the bar are indeed full of art. But it’s an actual hotel, too. A plastic chimpanzee, dressed like a bellhop, greets guests at the door. Budget dorms, which look like Israeli military barracks, have no frills. You’ll share a bathroom, stash your bags in a locker, and receive complimentary earplugs when you book one of the beds. The scenic rooms, decorated by renowned artists, are more elegant. They feature jewel-toned walls, stylized furniture, and floor-to-ceiling windows. They overlook “the worst view in the world”—that would be the wall—though. While the presidential suite is decked out with a rooftop terrace, a four-person hot tub, and even a movie theater. Its centerpiece is a bullet-ridden water tank. The tongue-in-cheek playfulness continues throughout the rest of the hotel, as well. The piano bar has a British colonial theme (they administered the city from 1920-1948). You can sit on a leather-bound couch and sip tea from fine bone china as you gaze at vandalized oil paintings and statues choking on tear-gas fumes. There’s a bookshop with every book ever published about the wall. Art supplies—meaning spray paint and rentable ladders—are available at the Wall Mart. On a more serious note, there’s a gallery with Palestinian artwork and a museum with exhibits about the history of the wall. Plus tours can be arranged to both walk along the wall or visit a nearby refugee camp. Once again, Banksy has started a much-needed conversation. But are you willing to travel to a conflicted area to be part of it?